Just brought in the last of the green 'Rutgers' tomatoes, FG. Freezing weather's not far off here in Georgia, and I'm going to fry these green beauties with breakfast, as well as try out your Green Tomato Relish. It sounds delicious. I LOVE this picture. He's sssooooooo cute! Showing off the new fur coat -- doesn't Dan know that's not PC? 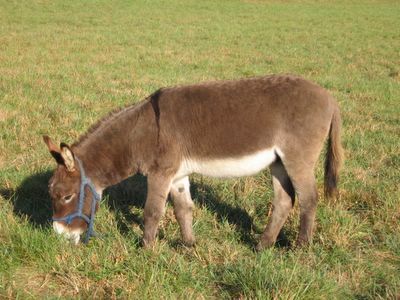 I want a donkey. Specifically, Dan. I will trade you one white fluffy dog for him...? 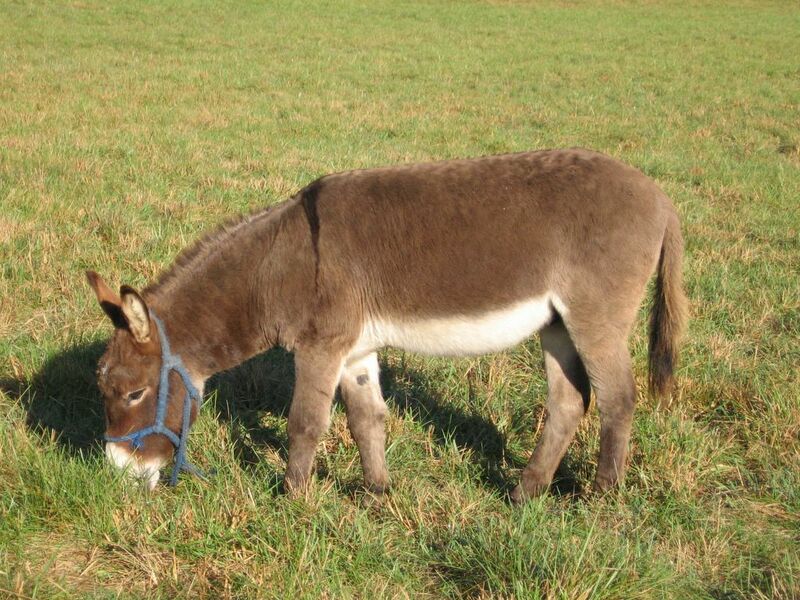 Velveteen donkey? Go out and cuddle him. That's what I'd be doing. Until I got smacked. He's so cute when he gets all fuzzy!! He looks like he's straight out of a storybook! Oh my, he is oh-so-cute, my kids just wnat to come on over and hugg him! His coat looks the plushy outsides of the fanciest stuffed animals. I think he would make a wonderful model for such a thing. In fact, I am now picturing an entire Farmgirl stuffed animal collection. Cary, Dan, Liselotte, Whitey, New Cat, etc., and, of course, Lindy the Chicken. Each one comes with a small storybook. I wonder why I am always having marketing fantasies involving your blog. This is not something I do a lot, I assure you. I have never in my life done a business-y thing more advanced than the usual childhood lemonade stand. I think a rubber Lindy the Chicken would be a hoot! Er...cluck. P.S. Every time DDD brays in my face I think of the people like you who want a sound clip. One of these days. . .
New Cat is indeed getting his winter coat. He's already starting to get that regal look about him. What am I going to do with you? Nice try. Smacked by who? Dan? Never! He really is getting awfully friendly toward me (FINALLY). He loves to be scratched (even on those ears! )and sometimes he'll give my shin a playful little nip (very gentle) like he does to Bear when he wants to play. He's just a young guy still and can be quite frisky. I know. I love how he looks when he's all slicked out, but that fluffy look is just beyond cute. I love, love, LOVE it. How cute would that be to have a stuffed animal collection of all my favorite farm critters? Can't you see Chip & Chip in there, too? Just the other day I was hunkered down next to Snugglebunny, scratching her woolly face, looking into her big dark eyes, and telling her for the millionth time that she looks like a big stuffed toy with her cute woolly face. Jeff, Jeff, Jeff. . . Truth be told- I was actually thinking of Steiff-their animals are so individual, and beautifully colored. (I too was wowed by the giant FAO Schwartz Steiff animals as a kid!) I have a small Steiff bear, which actually belongs to my daughter. I'm , um, keeping it for her, in case she wants it later. Of course, if Jeff has his way, the chickens wil be by Uniroyal. I'm thinking more like "rustic" cartooney cushion-animals with crude outside stitching? The sort children might make? Hahahahaaaaa! Yes, FG, it does actually freeze in Georgia, and a lot more often than one might think! Most of the state is in USDA Zones 7 and 8...not *quite* tropical, but mostly mild winters. Coldest it gets here is in the teens, and that's not for long. Average low is 32 to 38.